A flash flood surprised drivers in Orange County on Saturday night, leaving some motorists stranded in the dangerously rising waters. Thanks to the bravery of the Orange County Fire Rescue, the stranded motorists were rescued and no one sustained injuries. But with the approach of major Category 4 Hurricane Matthew on the horizon, Orlando residents need to know how to survive if they are stuck in a flash flood while on the road more than ever before. Of course, no one should drive in severe weather like a flash flood or hurricane if they can help it, but sometimes these conditions strike suddenly while commuters are on the road. In the case of Saturday’s flash flood, an emergency alert was sent out to residents’ mobile devices before 8 p.m., but some motorists were already on the road before they got the alert, according to reports by the Orlando Sentinel. With Hurricane Matthew on the way, it’s worth knowing how to stay safe when driving through a flash flood and what to do if you are stuck in rising flood water. The best way to stay safe during a flash flood is to wait out the flood before driving, advises the National Weather Service’s “Turn Around Don’t Drown” campaign, as more than half of all flood-related drownings are a result of vehicles sinking in flood waters. But if you’re already on the road when you receive the alert for a flash flood, what should you do? Drive away from low-lying areas that are subject to severe flooding and head for high ground, advises the Federal Emergency Management Agency. Try to estimate the depth of the water before driving into it. The water may be far deeper than it appears. Just six inches of water can cause a vehicle to lose traction and 12 inches of flowing flood water can lift and carry off a small vehicle, according to the NWS. Never attempt to drive into these deeper waters. Drive slowly and steadily if the standing water is determined not too deep. Your brakes may not work properly if you are driving through water a few inches high, so it is best to maintain a low and cautious speed. Never drive past a posted barricade if you come across one during a flash flood, advises the NWS. These are put in place to warn motorists of deep waters that may be filled with hazards, such as downed electrical wires, chemicals, and washed out road surfaces. What Do I Do if I’m Trapped in Rising Flood Water? Becoming trapped in rising flood water is a nightmarish experience, but there are steps motorists can take to survive and escape to safety. 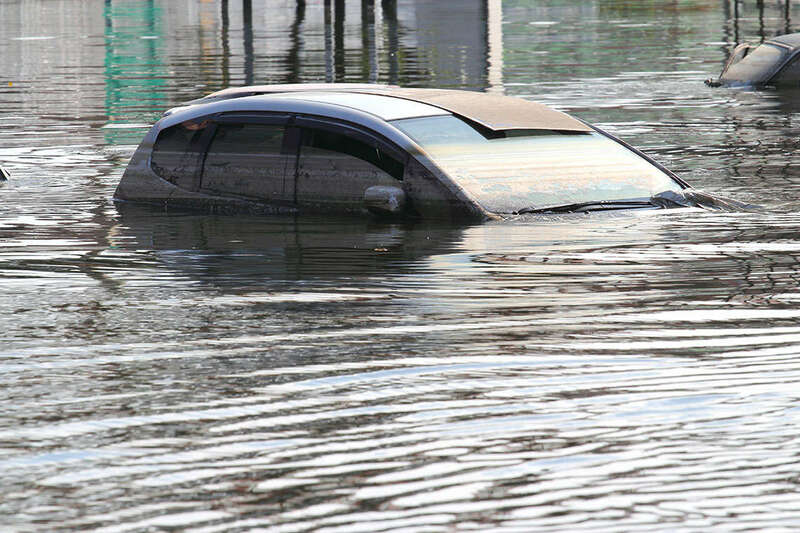 If your car stalls, but the flood waters have not risen high enough to begin flooding your car, you should open your door, leave your vehicle, and walk to higher ground immediately, recommends the NWS. If flood waters are rapidly rising around you, try to lower your windows slowly, unbuckle your seatbelt, and be prepared to escape through the window to higher ground, advises Popular Mechanics. Avoid opening the door unless you absolutely cannot escape through the window, as it will flood the car with water at a much quicker rate. Get to dry land as quickly as possible to minimize your time in the flood waters. The flood water could be contaminated, full of dangerous debris, or could suddenly surge, sweeping you down stream. Never go back to your vehicle during the flood. It’s simply not worth your life. Driving through flash floods is just one of the many dangers that severe weather can pose to motorists in Orlando. Car accidents are always an increased risk during inclement weather. If you’ve been hurt in a car accident recently as a result of another motorist’s irresponsible driving, our attorneys may be able to help. Read more to learn how our car accident attorneys will fight on your behalf for the maximum compensation from the insurance company. If you are ready to pursue a claim, fill out our free, no-risk case evaluation form today.